Friday morning I had a meeting with a customer, near Birmingham, a couple off hours north of London. As it was an early meeting, I could not get to the meeting on time taking the train, so I borrowed a car from work and drove up. After the meeting was over, I decided to spend the balance of the day touring the area. I drove about an hour further north, to Nottingham – yes that Nottingham. The whole Robin Hood/Sherwood forest (there still is a Sherwood forest – I even drove through it…) thing. After parking the car I wandered up to Nottingham Castle, where they have taken the old castle (knocked down and rebuilt by numerous people since the infamous “Sherriff” was in attendance) and turned it into the local tourist attraction. Of that original fortress, part of the gatehouse from the 1250s still stands (although the moat was, sadly, filled in). The current structure was someone’s home until not too long ago (relatively speaking), and had been returned to the public in the early 1800s, as one of England’s first art galleries. The grounds have been beautifully worked, and they had a good display that showed where the original fortifications and abbey once stood. 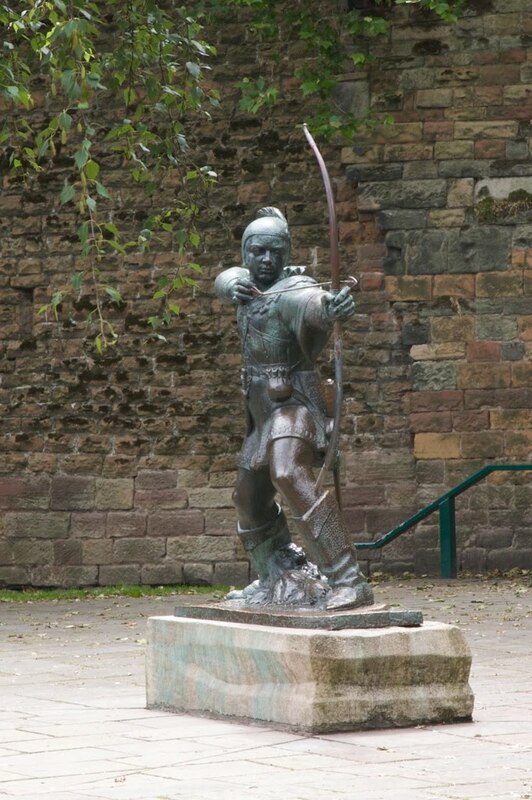 And of course, there were lots of statues and information about Robin Hood. After wandering the castle for a little while, I had lunch at Ye Olde Trip to Jerusalem Inn, billed as the oldest pub in England. They dated it in the literature to 1189, and the name references the Crusades. Who knows how much is true, but it’s a very cool pub, regardless. It’s built in to the cliff face beneath Nottingham Castle, right into the sandstone. The front room where I had lunch (while it was nice out, the atmosphere in the place made it worthwhile to sit inside) had a roof made from the sandstone above, making it kind of cave-like. The Olde Trip ale was good, and the food was pretty good as well. It seems that the area around Nottingham is all sandstone, which is particularly sensitive to erosive forces. As a result, the entire city has an extensive cave structures under it. I read something that said there are almost 500 caves identified under the city. There was a “Nottingham Caves” attraction that I thought might be cool. Sadly, I found it – in the basement of a mall and it looked too lame, so I passed and headed out to do a bit of a drive. Heading north from Nottingham, I chose to go to the Peaks District, a very beautiful area that was designated as Britain’s first National Park in 1951. One of my guide books has a tour through the area detailed, so I thought I would try it out. Let me tell you, one afternoon was not nearly enough! While only 60 km in length, I could easily have spent a full weekend doing that drive. Of course, the weather went to hell, which meant fewer photos, but it was still an amazing drive. The drive was the best part of the day – I forget some times how great it is to just get out and go for a drive. The roads, once off the highway were classic English country roads – narrow, winding tracks, through the country-side. One minute, wide open fields surround you; then you’re penned in by hedgerows, so tight that the branches are brushing by the outside of the car; next there are stone walls right up to the edge of the road. And of course everyone is driving way too fast – but that’s part of the fun. The area itself is quite beautiful. As you drive through the area it changes quite dramatically. There were areas of forest, surprisingly some very hilly, rocky areas, ,and of course the ever-present emerald patchwork of the English farms, spread across the countryside in a patch-work-quilt pattern, criss-crossed with low stone walls, the fields patterned with the white dots of sheep. My first stop of interest was Arbor Low, the “Stonehenge of the North”. Of course, nothing is like Stonehenge, but this was still pretty cool. The site is almost as old as Stonehenge, and comprises of a fairly large earthen ditch (the “henge”), with 46 large (4-5 feet long) laid out in a circle. They figure they were standing stones at one time. Interestingly, this was the first site protected by Queen Victoria under the English Heritage program. 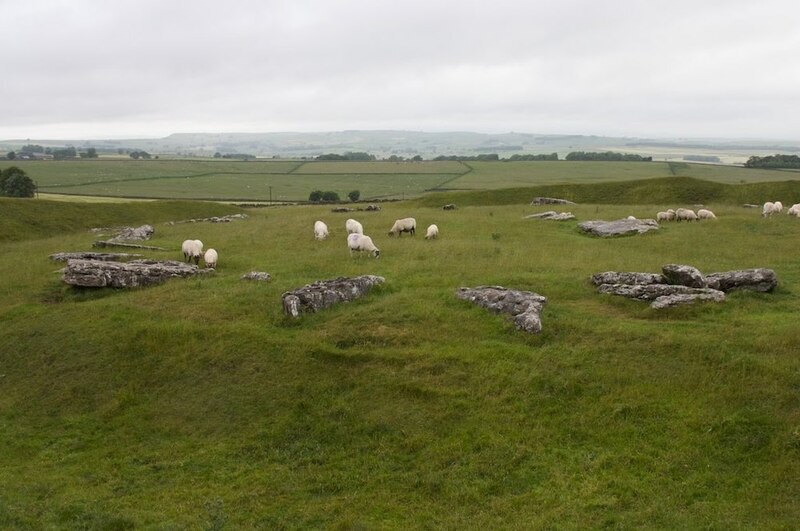 One of the interesting things about the site is that it’s literally in the middle of a farmer’s field – there were sheep grazing amongst the stones. You walk through this guy’s farmyard to get to the site, and drop a pound in a tin box to help compensate him. I guess it works. At about this time it started to rain pretty heavily. My route lead me further north, and into the town of Buxton. Buxton must have had some prominence in the past, as it was way nicer than you would have expected, for a small town in the middle of a park. Due to the rain, I didn’t have a chance to explore or take any pictures, but the town’s bath (a spa, developed in the 18th century) and Opera House (Victorian) would be worth coming back to see. I had to do a conference call at this point, so I sat in the car, in the rain for about an hour. The rain was still falling, so I gave up on Buxton and continued on my way. At the “top” of the planned route were some spectacular views, but given the rain I figured I’d pass and start the drive back. I took a bit of a longer route, heading slightly south through the park. One of the stops along the way was the small town of Eyam, perched on a hill, just off the main road. 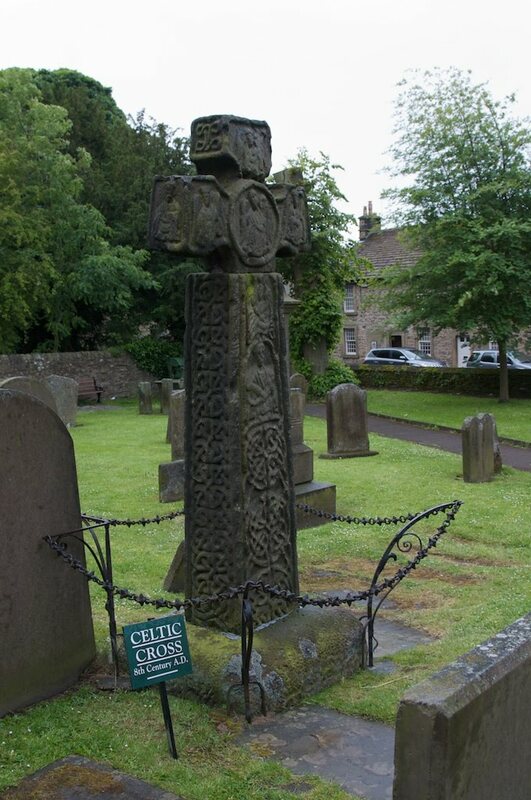 The guide book recommended the church graveyard, for a spectacular 8th century Saxon cross. It was pretty amazing, and as the rain had mostly stopped, I was able to take a few pictures. The rest of the day was spent wandering back towards London. For the first part of the return journey, I continued to wind my way thought some very beautiful countryside. The road took me past Chatsworth House, “one of Britain’s most impressive stately homes” (I was too late to stop), built from 1687-1707. One of the more unusual sites was not too much further down the road. I had been driving for 15 or 20 minutes, seeing only sheep, when all of a sudden, just slightly down this side road off the main road, I see a carnival. Seemingly in the middle of nowhere, a small carnival, with a couple of rides, those silly game booths and a popcorn machine or two. It was slightly surreal – I’m assuming there was some small town hiding around a bend in the road or something. The rest of the drive home was uneventful, as I stuck mostly to the main motorways.